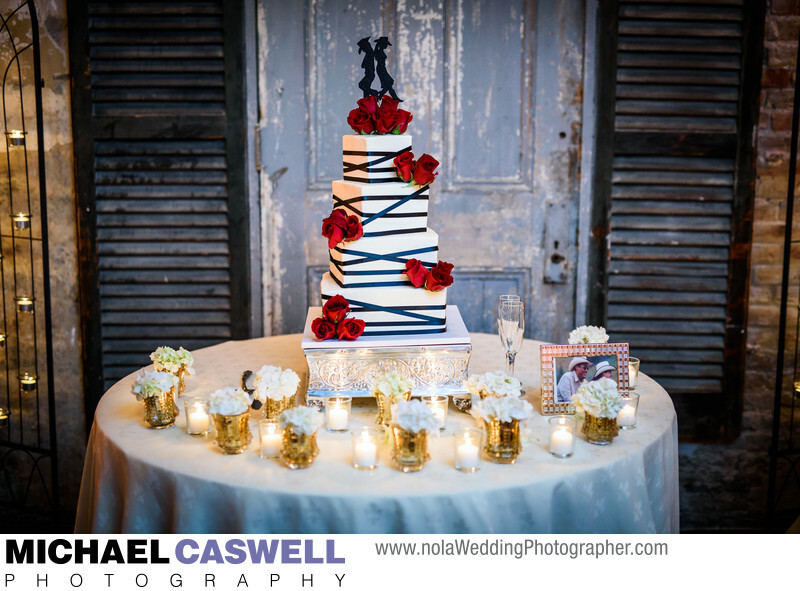 This couple's lovely wedding cake was created by Haydel's Bakery, while the gorgeous decorations that adorned the cake table were crafted by the legendary Meade Wenzel. The exposed brick wall, along with the old wooden door and shutters make a wonderful background. Meade also did a fabulous job decorating the courtyard for the wedding ceremony, and the reception space as well. Weddings at the Hotel Mazarin, formerly the St. Louis Hotel, previously used the courtyard for both the ceremony and the reception. But this French Quarter hotel now uses its beautifully renovated La Louisiane indoor space for receptions.